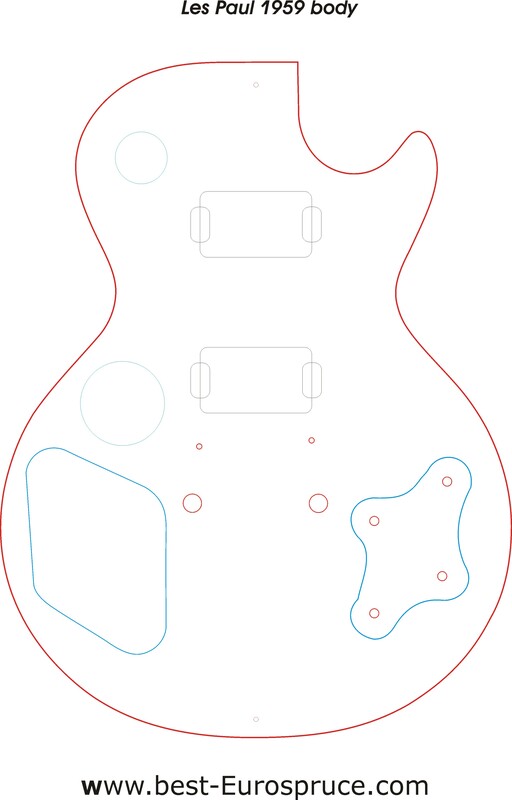 This site is meant as a comprehensive collection of free and downloadable guitar plans. No plan is for sale, all are taken from other places where they were accordingly offered as shareware for free. Stratocaster necks (incl. 70s CBS headstock) in CorelDraw format .cdr! There has been some request for particular drawings/templates from vintage 1959 LesPauls. first to come is a drawing from a vintage heel shape "bottom view", click here for a .pdf of such. The heel is (around) 5/8´´ wide (and wider), ending (tip) right at the exact position "middle of 14th fret". next is a side-profile around the heel showing the part of the heel that is flat and not molded. Put this template on the side of the neck (positioned at the tip of the heel) and mark the curved line on the wood: all that is covered by the template is (reg. the side of the neck) the flat part of the heel and not shaped/curved, the part above the line (towards the headstock) is molded while shaping the heel and neck. Template shows the thickness of the heel +0,5mm thicker than final (final 38,1mm). Above links are .pdf for paper-printing, you can make your own templates from this. As an alternate we offer CNC´d templates made from 3mm MDF according above .pdfs, just ask if interested. We are glad to include more credits, please let us know. And: as always no guarantee for anything like right dimensions, building success etc. - happy building! More to come - or just ask for any plan you are interested in. If we have it and it is not copyright protected we will be glad to share with you.